On Monday evening we were lucky enough to attend a special “Cut and Taste” event at Morton’s with Paul Garmirian (PG) Inc. We’d like to tell you a bit about this extraordinary experience not to gloat, but to demonstrate how wonderful cigar events can be—especially when you’re working with pairings of delicious drink, fine cuisine, and premium tobacco. The evening began with a patio reception featuring a three-piece jazz ensemble and appetizers of smoked salmon, tenderloin crostinis, and mushroom canapés. Being the rum guy that he is, Patrick A stuck with Cruzan Single Barrel (neat) while Patrick S enjoyed a Broquel Malbec. Our friends at PG provided Long Panatellas from 1996, an excellent choice given the cigar’s sleek, elegant format and mild, smooth taste that leads into spice and salt. We were having such a good time we almost didn’t notice it was far too hot and humid to be outside in a suit. Heading into the air conditioning we were greeted with a crisp asparagus salad and a serving of colossal shrimp. This was followed by a PG Robusto II from 1999, which sported a pleasant interaction of cream and spice with a subtle floral and fruit backdrop. 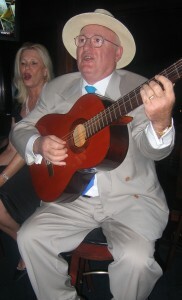 It was around this time that Paul Garmirian, founder of PG and author of the widely-read book The Gourmet Guide to Cigars (1990), busted out his acoustic guitar and joined in with the band for a song (pictured at right). The main course of perfectly prepared filet mignon, sautéed mushrooms, and mashed potatoes was simply fantastic. A Nicolas Potel Burgundy was a nice complement to this entrée, as it was to our third and final cigar: a PG 15th Anniversary Belicoso Extra from 2004. This was the most full-bodied and, in our opinion, finest stick of the night with a tremendous taste that bears comparison to the Davidoff Millennium Blend. The profile is so well-balanced that individual flavors are difficult to identify (the four courses of different drinks didn’t help either). We’ll have to get our hands on a few more to put together a full review. In all, we’d like to extend our thanks to the staff of the Morton’s in Reston, Virginia, and Paul and Kevork Garmirian for a spectacular evening. Such an experience shows how wonderfully fine cigars, cuisine, and drinks can all enhance each other. We had a lot of fun living well beyond our means, and we hope this article motivates you to do the same—at least for one evening. sounds like you guys had a great time! i took home a couple of the cigars myself from the dinner…looking forward to sharing them with my brother after his wedding.